The casino opened on February 12th, 2008, and the race track has been there sense 1972. The facility consists of a thoroughbred racing track accompanied by a large casino. 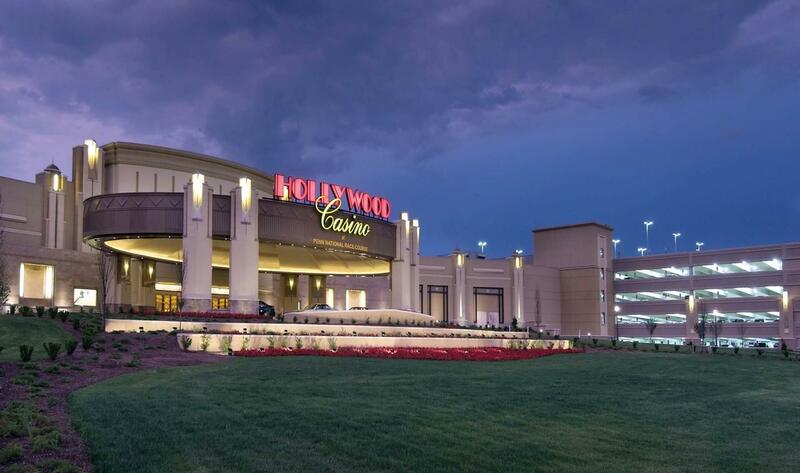 It is in Grantville, Pennsylvania near Harrisburg and it is owned and operated by Penn National Gaming. This project consists of three very large sub-projects all requiring access to each other while separated by expansion joints. The casino is a 550’-0” x 350’-0” two story composite steel structure with an elliptical porte cochere, the racetrack grandstand is a 400’-0” x 250’-0” five story composite steel structure that has an additional 200’-0” x 100’-0” one story jockey’s quarters separated from it by yet another expansion joint, and the parking garage is a 400’-0” x 275’-0” precast structure that houses all of the parking for the above structures. M&L Inc. provided the structural engineering for the Racetrack grandstands and GPLA Inc. provided the structural engineering for the other two structures. The work was done in the two separate offices (GPLA in Santa Clara, CA and M&L in Denver) using our virtual network and proving that personnel utilization can cross any distance. The enabling detail on this project was to build stepped composite beams to make the major steps in the grandstand. The secondary steps were achieved by installing Polystyrene over the composite slab and 2” of concrete over that. In this way, vibration and noise were minimized and fire rating was maintained between levels.